Meet your neighbor and Illini West Senior Paige Mary Bray of La Harpe. Paige is the daughter of Susan and Wayne Bray. Paige was born on March 11, 1996 in Macomb and raised in La Harpe. Paige is the youngest of three children. She has two older brothers, Randy and Kevin. Randy, 26 and his wife Kelsey live in Colchester and are expecting their first child in May. Kevin is 21, lives at home and attends Western Illinois University. Paige's grandparents are Lillian Bray of La Harpe and Wendell and Eleanor Link also of La Harpe. Paige worked at M&M&m Farms this past summer and plans to work there again this summer. At Illini West High School, Paige has stayed very busy. She plays volleyball, runs track and enjoys band. 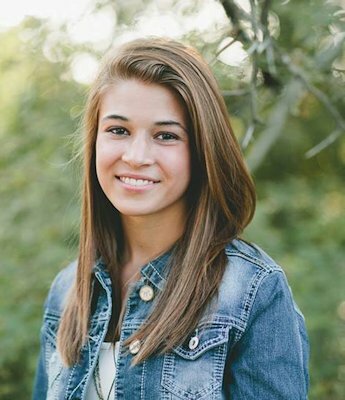 She is also involved in the following clubs: NHS, SADD, and the Get R Done Club. She enjoys running and spending time with her family and friends. Paige has enjoyed going to state every year in track. She plans to attend college and run for track. She will graduate from Illini West in May of 2014.